I’ve long thought our reverence for a low and no fat diet has failed us. Just look around. Ever since the US government began pushing more carbs and less fat, and food manufacturers all but wiped full fat products off the shelf, as a nation we’ve grown fatter than ever. 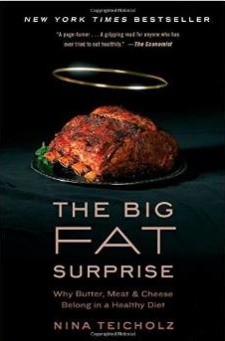 Now, The Big Fat Surprise uncovers 9 years worth of investigation by its journalist author, Nina Teicholz, tracing how one man – Ancel Keys – convinced food experts, scientists, researchers the government and the American public that saturated fat was the devil – and changed our diet. Keys massaged much of his research to fit his notion that fat and red meat was our downfall. Study after study was faulty and wrongfully reported. Keys also liked being the persuasive savior and his charisma filled a room until all were convinced. I am two-thirds of the way through the book so I can’t tell you if we will find at the end the Big Truth, but I do believe sugar and carbs have increased our waistline, not fat, and the sooner we drop those containers of skim milk and no fat fruit yogurt and add some eggs, red meat and cheese back into our diet, the better off we’ll be. Unfortunately as pointed out in the book, the studies that contradict the merit of low-fat eating, you don’t read or hear about. Because they fly in the face of 30 years of our adopted “wisdom” they never get published. And, I know from marketing, if you hear something often enough you think it’s true whether it is or not. In the great morality play of modern diet, the angels, we have been told by a host of experts, favor egg-white omelets and skimmed milk, while the devil gorges on red meat cooked in butter. For 50 years we have been warned to fight the good fight on dietary fats if we want to stay healthy. In “The Big Fat Surprise,” as one might guess from the title, Nina Teicholz plays the devil’s advocate—convincingly. …when skeptics, including the National Academies of Science, weighed in on Keys’s impoverished data, and on related claims that multiplied over the succeeding years, the media attacked the skeptics, heedless of statistical reasoning. Meanwhile, the food industry—apart from the protesting cattle and dairy lobbies—happily ministered to the new dietary wisdom. Government agencies weighed in with dietary guidelines that emphasized carbs and vegetables and warned that red meat was something one could only risk eating a few times a month. And when this miserable diet, shorn of taste, wearied its adherents, as it so often did, the pharmaceutical industry stepped in, offering drugs to lower cholesterol. ← Among the bulk fruits at Costco – me!